Following the isolation of graphene in 2004, a race began to synthesize new two-dimensional materials. These are single-layer substances with a thickness of between one atom and a few nanometers (billionths of a meter). They have unique properties linked to their reduced dimensionality and play a key role in the development of nanotechnology and nanoengineering. An international group of researchers, including Brazilian scientists affiliated with the University of Campinas (UNICAMP), have succeeded in producing a new material with these characteristics. The researchers extracted a 2-D material they call hematene from ordinary iron ore. The material is only three atoms thick and is thought to have enhanced photocatalytic properties. This innovation is described in an article published in Nature Nanotechnology. "The material we synthesized can act as a photocatalyst to split water into hydrogen and oxygen, so that electricity can be generated from hydrogen, among several other potential applications," said Douglas Soares Galvão, one of the authors of the study and co-principal investigator at CCES. 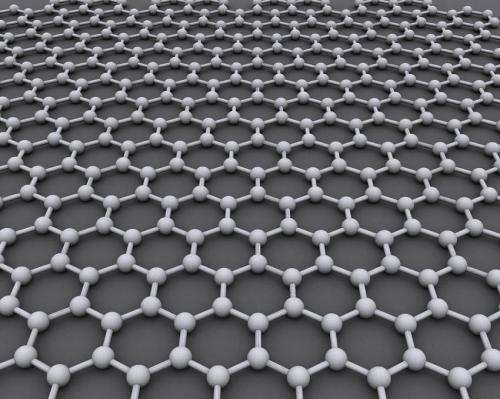 Unlike carbon and its 2-D form graphene, hematite is a non-van der Waals material, meaning it is held together by 3-D bonding networks rather than by nonchemical and comparatively weaker atomic van der Waals interactions, which are noncovalent (they do not involve the sharing of one or more pairs of electrons by the atoms that participate in the bond). Because it is a naturally occurring mineral, has highly oriented, large crystals and is a non-van der Waals material, the researchers believe that hematite is an excellent precursor for the exfoliation of novel 2-D materials. "Most of the 2-D materials synthesized to date were derived from samples of van der Waals solids. Non-van der Waals 2-D materials with highly ordered atomic layers and large grains are still rare," Galvão said. Hematene was synthesized by the liquid-phase exfoliation of hematite ore in an organic solvent, N,N-dimethylformamide (DMF). Transmission electron microscopy confirmed the exfoliation and formation of hematene in single sheets with a thickness of only three iron and oxygen atoms (monolayer) and in randomly stacked bilayer sheets. Tests and mathematical calculations were performed to study the magnetic properties of hematene. The results showed that they differed from the magnetic properties of hematite. While native hematite is antiferromagnetic, hematene is ferromagnetic, like a common magnet. In ferromagnets, the dipoles are parallel and aligned in the same direction. In antiferromagnets, the dipoles are antiparallel and aligned in opposite directions. The researchers also analyzed hematene's photocatalytic properties—its capacity to increase the speed of a chemical reaction when energized by light. The results showed that photocatalysis by hematene is more efficient than photocatalysis by hematite, whose photocatalytic properties are well-known but not strong enough to be useful. The group have investigated other non-van der Waals materials for their potential to give rise to other 2-D materials with exotic properties. "There are a number of other iron oxides and derivatives thereof that are candidates for originating new 2-D materials," Galvão said.